The Big Wobble: "Scariest thing I've ever gone through" wind gusts at 262 kph (163 mph) breaking windows: Cyclone Debbie hits Queensland a once-in-a-hundred year event! "Scariest thing I've ever gone through" wind gusts at 262 kph (163 mph) breaking windows: Cyclone Debbie hits Queensland a once-in-a-hundred year event! Sustained winds of 185 kph (114 mph) with gusts reaching more than 262 kph (163 mph). It's already left a path of destruction through outlying islands. "Scariest thing I've ever gone through," Sassha Kozachenko said on Instagram. Residents reported their apartments shaking and windows breaking. Cyclone Debbie hits Queensland a once-in-a-hundred year event! Tropical Cyclone Debbie is making landfall across the coast of northeast Australia, packing sustained winds of 185 kph (114 mph) with gusts reaching more than 262 kph (163 mph). The storm is lashing the Queensland coast with torrential rain, bringing about a significant flooding risk, meteorologists said. 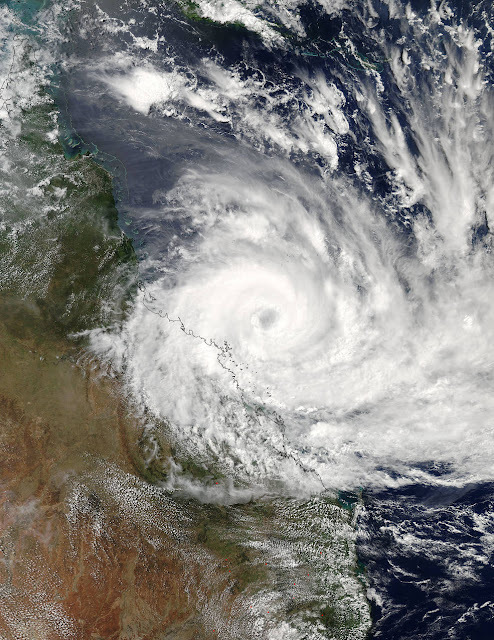 The Category 4 cyclone is the equivalent of a Category 3 hurricane and is very slow-moving. "With the very, very strong winds if they just sit there and twirl, it's like a battering ram," Queensland police commissioner Ian Stewart told CNN affiliate 7 News. On Airlie Beach, detritus and debris could be seen hurtling through the air in videos posted on social media. The storm already has ripped trees from the ground and brought significant rainfall to the region. Residents reported their apartments shaking and windows breaking. Pristine beaches that were bright and sunny Monday were completely flooded Tuesday. In the span of an hour, 211 millimeters (8 inches) of rain hit the area, Queensland Premier Annastacia Palaszczuk said. It was a once-in-a-hundred year event, she said. "This is going to get worse," Palaszczuk told Nine News Queensland. 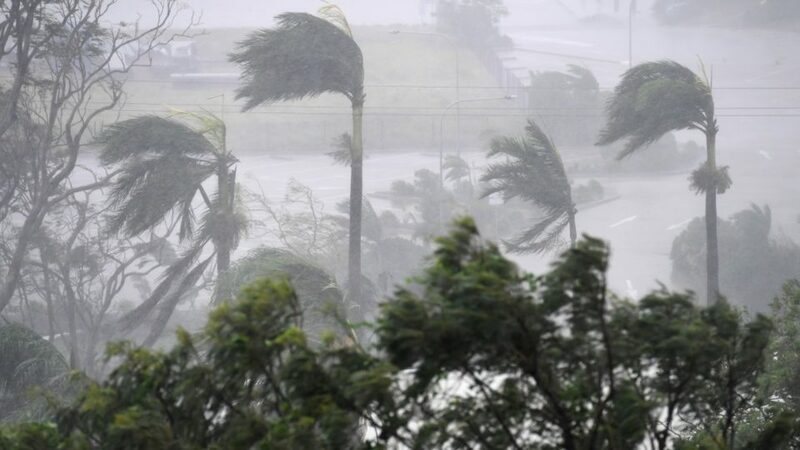 Cyclone Debbie lashed the area between Bowen and Airlie Beach during the mid-afternoon with wind gusts up 270 kph (167 mph), according to the Australian Bureau of Meteorology. Though authorities were seeking to evacuate 25,000 people in the lead-up to the storm, Palaszczuk told Sky News Australia, the time to leave is over. "I need people and families to remain in place," Palaszczuk said. The severe weather has already claimed the life of a 31-year-old woman after dangerous conditions were linked to a fatal car crash Monday near the town of Proserpine. 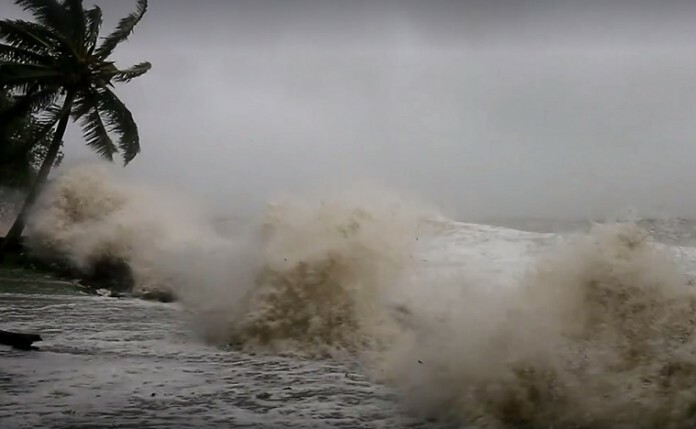 Residents along the coast have been warned to expect storm surges up to four meters high. Cyclone Debbie is the largest storm to hit Queensland since the Category 5 Cyclone Yasi in 2011, which ripped homes from their foundations and destroyed farmland. Debbie could end up being as severe as Yasi, Palaszczuk warned. John D Ginger, research director at the Cyclone Testing Station at James Cook University, said that coastal buildings were most at risk. "Houses in low-lying coastal regions ... and [which] are subjected to storm surge will be vulnerable to significant damage," he said. The timing of cyclone Debbie's expected landfall coincides with a 12-foot tide in Bowen, one of the highest tides of the year, according to 7 News. "If you are in a storm surge zone and you are directed to leave -- you must leave. You cannot shelter from a storm surge," Queensland police tweeted Monday.